It’s past 4:30 am and I just can’t sleep thinking about our Lumad brothers and sisters who are being displaced, killed and raped as we write and speak. I remember the indigenous children and organizer I met way back in 2007 and the stories they shared — the shock, pain, fear and instability that the Philippine military and government have sown in their minds and hearts, but at the same time, the strength and resistance as a community these state harassment, terrorism and militarization have instilled and cultivated in them. 8 years and under a new President, but the same ‘counter-insurgency programs’ are still being implemented by the Philippine government — Oplan Bantay Laya under Gloria Macapagal Arroyo’s time, Oplan Bayanihan under Benigno Simeon Aquino III’s — all for the sake of profit and subservience to their imperialist masters. The Dumagats are from the North, while the Lumads are from the South. But they have the same government, only under different names, whose perpetual goal in life is to kill any form of collective resistance by the people — because it could not provide what these communities can for their own, because it cannot accept the fact that the communist rebels have done more for these communities than any of their leaders combined. NOTE: This was written originally in Filipino. But English translation is provided below for those who cannot understand Tagalog. Whew. Nosebleed. Hehe. Dahil magba-bagong taon na naman, naisipan kong mag-ayos ng mga gamit. At nakita ko ang isang notebook kung saan naroon ang ilang mga naisulat ko noong 2007 na hindi ko na naipasok sa blog. Ilan sa mga ito ay ang mga linyang tumatak sa isip ko mula sa mga naging pag-uusap namin ng isang organisador ng mga katutubo at ng isa sa mga batang Dumagat (katutubo mula sa Quezon) na naging estudyante namin sa Kampo Sining Pambata (KSP)* noong May 2007. Mahigit dalawang taon na ang nakaraan pero patuloy pa rin ang malawakang displacement at ang pangangamkam ng estado at monopolyong kapitalista sa mga lupaing sa simula’t sapul ay inalagaan, kinalakhan, at tinirhan ng mga kanunu-nunuan pa ng mga kapatid na katutubo. Pero habang tumitindi ang panggigiit at panlalapastangang ito, hindi rin mapipigilan, at sa halip, ay patuloy pang lumalakas ang pag-oorganisa ng mga katutubo [http://katribu.org], kasama ang buong sambayanan, upang labanan ang mga sakim sa yaman at kapangyarihan. Because it’s new year once again, I decided to clean up. And I found my notebook on which I have written some things in 2007 that I wasn’t able to post on my blog. Some of these were lines that stuck in my memory from my conversations with an organizer of indigenous peoples and with one of the Dumagat kids (indigenous from the province of Quezon) who became our student in the Summer Art Camp for Kids* in May 2007. It’s been more than two years but the widescale displacement and grabbing by the state and the monopoly capitalist of the lands, which had been nurtured, inhabited and where even the ancestors of our indigenous brothers and sisters were raised in, still persist. But while the harassment and total disrespect intensify, the organizing by indigenous peoples cannot be preempted and instead, continues to strengthen [http://katribu.org], one with the whole nation, in fighting against those who thirst for wealth and power. Some may find me posting this as offensive. But I enjoin everyone to look at this photo, however visually unappealing, and try to look beyond what you see. This is Emerito Samarca, Executive Director of the Alternative Learning Center for Agriculture and Livelihood Dev’t (ALCADEV) in Han-ayan, Liangga, Surigao del Sur. 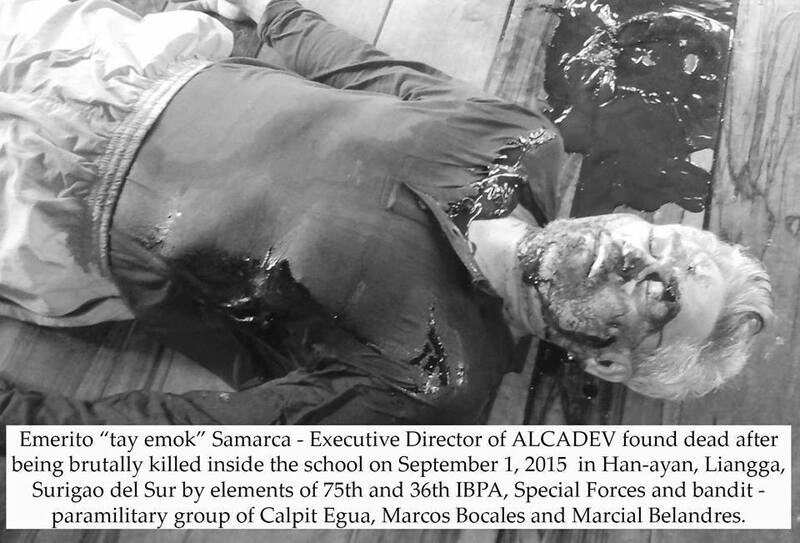 He was brutally killed inside the school by the elements of the 75th and 36th Infantry Battalion of the Armed Forces of the Philippines, Special Forces and bandit-paramilitary group of Calpit Egua, Marcos Bocales and Marcial Belandres. Two more were killed on the same day, Dionel Campos and Aurelio Sinzo, and hundreds more were evacuated due to the havoc caused by the militarization of Lumad communities. What I see beyond Tay Emok’s lifeless and tortured body is a whole population of indigenous peoples struggling to fight for basic rights and services — health, education and livelihood — being systematically erased by the Philippine government in favor of big profits from large multi-national mining companies taking over the lands of our people — lands that they and their ancestors have nurtured for hundreds of years — to the extent of their own lives being taken away by these greedy, inhumane, monstrous politicians and big landlords and big comprador bourgeoisie. While we may go about our own usual businesses of looking into our closets to decide on what to wear to office the next day, or checking out what movie to watch this coming weekend, hundreds of Lumads in another island of the Philippines are forced to move from barrio to barrio — for hundreds of kilometers each day — looking for safe havens to keep their families away from the fascist hands of the military operating under the chain of command of the President. All under the guise of Oplan Bayanihan, a “counter-insurgency” program devised to hunt down what they call “terrorists”. Is Tatay Emok a “terrorist”? Are Dionel and Aurelio “terrorists”? Are the Lumads “terrorists”? I’m pretty sure anybody who’s had the chance to meet them would shake their heads in indignation. This is Tay Emok’s lifeless and tortured body. What do you see beyond the blood? EMERITO SAMARCA, Executive Director of the ALTERNATIVE LEARNING CENTER FOR AGRICULTURE AND LIVELIHOOD DEV’T (ALCADEV), DIONEL CAMPOS, Chairman of MAPASU and his cousin BELLO SINZO, were killed by ELEMENTS of the ARMED PARA-MILITARY MAGAHAT/BAGANI FORCES @4am today, Sept 1, 2015 at the ALCADEV compound and km 16, Han-ayan, Brgy Diatagon, Lianga, Surigao del Sur. The School and community was occupied by elements from 36th IBPA and SF, telling them to evacuate with in 2 days or they will be massacred. Residents are now in KM 16, asking for help. DISBAND AND PROSECUTE THE KILLERS! STOP THE COLLUSION BETWEEN ARMED PARAMIL AND THE AFP! JUSTICE FOR EMERITO, ONEL AND AURELIO!